Native Americans on the Pacific Northwest coast knew that always voracious lingcod are attracted to anything that moves like a smaller fish. 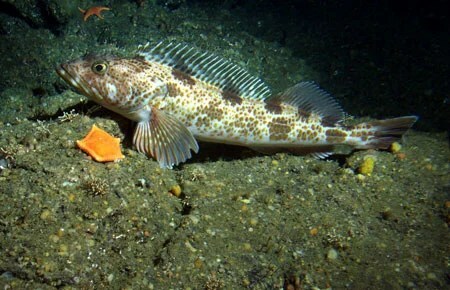 They learned to pull lingcod toward the surface with a clever visual attraction system, then spear or dip-net them from canoes in these clear Pacific waters. The fishermen used a long pole to push a hand-carved wooden lure down into the water. After the pole was disengaged, the lure fluttered and revolved slowly back toward the surface, drawing hungry lingcod behind it along the way. The lures were a fine blend of utilitarian function and folk art, often having splayed wings resembling a badminton shuttlecock to provide swimming action, but with heads chiseled to resemble a wolf or fish. Real fish could also be used as attractors. The fishermen filled the stomach of a greenling or tomcod with pebbles for weight, sometimes slicing off on fillet to make it move erratically. This hookless bait could be dangled from a rope to entice lingcod within harvesting range.